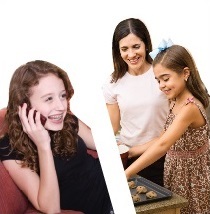 Mom’s Best Friend babysitters have completed our customized training, encouraging fun, creativity, responsibility, and professionalism, and specifically prohibiting calling/texting on the job, using TV/video games to entertain the children, etc. Sometimes our families try us as a compliment or backup to their regular sitters, and if you have any hesitations, we encourage you to do the same. However, after finding our babysitter service extremely professional, convenient (one call and we schedule a wonderful babysitter), and a great value, most families begin to use us as their primary babysitter source.